Polish jugger has formed a league consisting of five teams, mainly post-apocalyptic brethren joined by a viking reenactment group. There has been one tournament played this year, although next are already being planned. 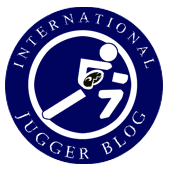 However, main focus of the community is to promote jugger, especially by playing it during various conventions. One of the promotional tournaments was held on Saturday 27 April 2013 during a convention ‘Grojkon’ in Bielsko-Biała. Actually, a few people admitted that they had known the game from the movie, yet they hadn’t had a chance to play it. Announcing among the visitors got us two new teams ready to take up the challenge. After the rules were simply explained and a show match was played, gathering spectators eagerly joined and formed next three teams ad hoc, which effected in a tournament of 5 teams of people generally new to the game. any. The newly-formed teams played well and followed fair-play rules.Team Chickens climbed the podium having won the third place, Raubritters were the runner-ups and TAD comfortably won. The level all players presented was surprisingly high and what is more important everyone enjoyed the event very much. Such games are played several times a month and will certainly be included in next conventions, which are quite often in Poland, and will hopefully let us gain more players for the sport. Probably, the next league tournament will be played in the beginning of July.